Thanks for stopping in today! I have another great book review for you- I know a few of you saw the pic I posted as a teaser yesterday on Facebook, and it seemed like a few were really interested in this soldering technique! 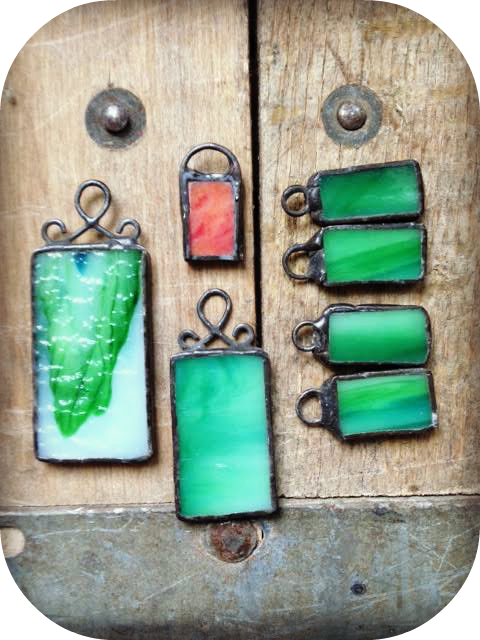 Below is the pic of the soldered stained glass pendants that Joe made for me awhile back. As you can see here, he didn't use 2 pieces of glass, but just one, for each pendant. And instead of clear glass, he used stained glass. We used a patina on the solder to darken it and I really love this look more than the shiny silver solder but you could certainly do anything you like. I just wanted to show you how it looked. Leave one comment on this post and I will pick a random winner to win a copy of this book tomorrow, Tuesday Feb 11 around 8am eastern standard time. I would be thrilled to put this book into action, thank you!!! I've been dying to give soldering a try as i have a lot of stained glass pieces that i want to turn into pendants!!! Great Book. Thanks for offering a chance to win it. Soldering is on my learning list this year....so yes I would love it. Another great book! This would be so much fun to have! Those pieces are terrific; I agree that dark solder is better. Thanks for the opportunity to win the book. Thanks for reviewing this - I've been looking for some books and tutorials on creating soldered pieces for a few months now, so this review has been timed perfectly! This looks like fun! Would love to win and learn something new. I have a little experience with soldering, but have not done this particular type of project - I would love to learn how to do it! Thanks for the giveaway!! It would be great to combine this technique with photography. Been thinking about it for some time and I'd love to try it! Your pendants are wonderful. Thank you for giving us a chance to win this book. I am ready to tackle soldering. This book will give me the needed push and knowledge. Beautiful pendant! I love the color. I dabbled in stained glass years ago and would love to incorporate it into my jewelry. Sounds great. Would love to win this book. Looks very interesting. They look great!! Love the soft soldered look. Would love to win this book. thanks so for offering the chance!! More talented artist authors sharing their work how exciting! Thanks, Lorelei, for hosting these giveaways. Soldering is on my list of things I want to work on this year. This would be a great help. Thanks for the chance. Ooh, always wanted to learn to solder and this book looks like a fantastic resource! Thanks for the opportunity! I am newly into soldering and I would love to learn this type of technique. Thanks for the opportunity to win what looks like an amazing book! Thanks for the book review and the chance to win the book. Looks like a lot of fun. I would love to win this book because I am very interested in making soldered jewelry components. I have taken a couple of classes in the stained glass soldering method, but I still need lots of practice. This book looks great! Thank you for the chance to win it! Very cool! Sounds like an interesting book! Sounds very interesting to try and I love how your pendants turned out. Thanks for the opportunity to win this wonderful book. I have just finished purchasing all of my soldering supplies, this would be a great book to win! Wonderful book! Would love to win. Another technique that I have been wanting to learn; soldering with copper tape. Looks like another great book. I appreciate the step by step photos as I am very much a visual person as opposed to learning from just text. Thanks for another great review and giveaway! Very cool that the publishers send you books to review-what a fun job! Thanks for sharing your review! This is also on my 'bucket list' of techniques to try! Soft soldering pendants etc is one of those things I want to learn but never seem to get around to. There's just so many things I could see myself doing with this technique. Must get some copper tape and sit down and learn soon! I've always wanted to give that a try! I know how hard it is to solder smoothly, as we do some of that in the optical shop. Great job, Joe. Would love the book, and thank you for offering it, Lorelei! I have attempted to solder glass before, and it was an epic fail. Looks like this book could offer me some much needed instruction! Thanks for hosting the giveaway! Thanks for the chance to win the book, and thanks for these book reviews. They are helping me add to my list of good jewelry making books to get. This looks like it would have some fun projects I could enlist my dad to do with me! Love the book! Thanks for the review! Ooh that looks like lots of fun....thanks Lorelei! Great Findings, appreciate that point. Thanks for the great video, Lorelei! Like visiting you in your studio! And thank you for the giveaway! Thanks for this giveaway, this looks like an interesting technique and I love glass! What a cool technique... A really new one is a rate find these days. I want to try this! I am in the process of setting up a soldering station so this book would be perfect for me. Thank you for the chance to win it. Thanks for the great review! I am the author, my next book should be out this summer. It will also be on the soft soldering technique with more advanced projects but this book will also include the hard soldering technique done with a torch and silver. There is a very handy trouble shooting section that will be helpful refining the art.